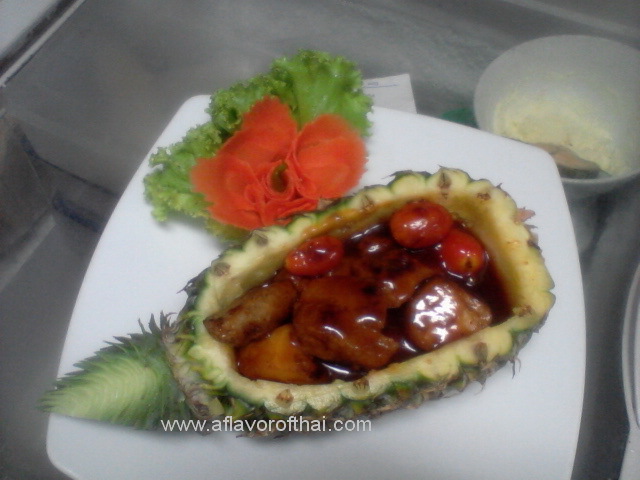 Baked Pork Ribs with Pineapple or “Gradook Mou Op Sapparod” in Thai. This Thai ribs recipe creates very tender ribs that are tangy-sticky good! They're easily made in your oven, so there's no messy parboiling involved - just stir together the marinade with the ribs and let them bake slow and long (the secret to tender ribs!). which makes these ribs taste simply divine. Great for everyday eating, and also makes a terrific party food. Enjoy! 1 can pineapple or fresh pineapple 1 cup of any shift yeah it's enough I cut into small pieces the Author took a little Spring onion for decorate. Heat oil in a wok. Wait until hot then add pork spare ribs, fry until nearly cooke. Heat water in a big pot over medium heat, wait until boiling then add fried pork spare ribs. Add Pineapple and the rest ingredients, and turn down to low heat. Simmer for 30-40 minutes until the spare ribs are tender. Garnish on top with spring onion. *Chinese Rice wine plays a major role in Chinese cuisine, possibly coming second only to soy sauce in importance. Made from fermented glutinous rice or millet, rice wine is used to tenderize meat and seafood in marinades, and to impart flavor to food. Rice wine even forms the basis of an herbal soup meant to help new mothers recover quickly after giving birth. Chinese Rice Wine available at Chinese/Asian groceries.